A final photo-essay from our trip last autumn. 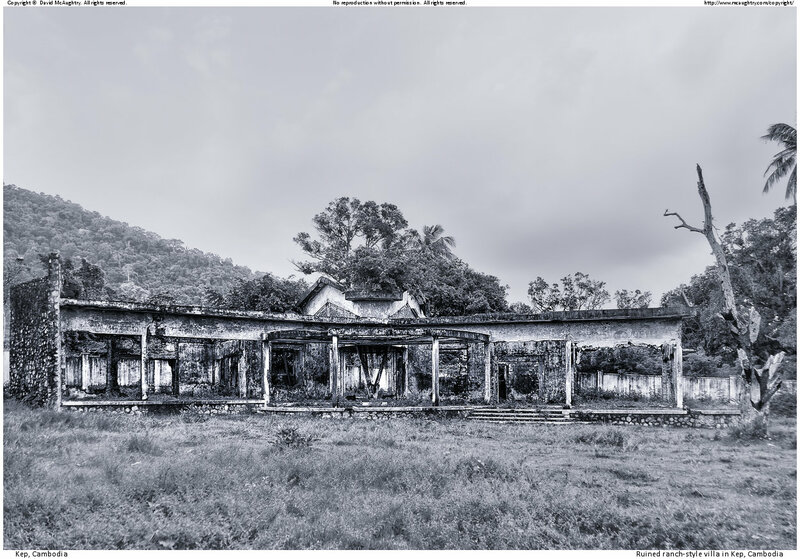 This time it is the elegiac ruined villas of Kep – a place of many surprises, including the provenance of these buildings. 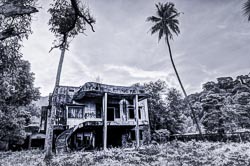 One of the things I had heard about Kep was the abandoned villas that were scattered through the area. They weren’t particularly apparent from our hotel, so one afternoon I chartered a tuk-tuk driver to take me round all the villas he knew. 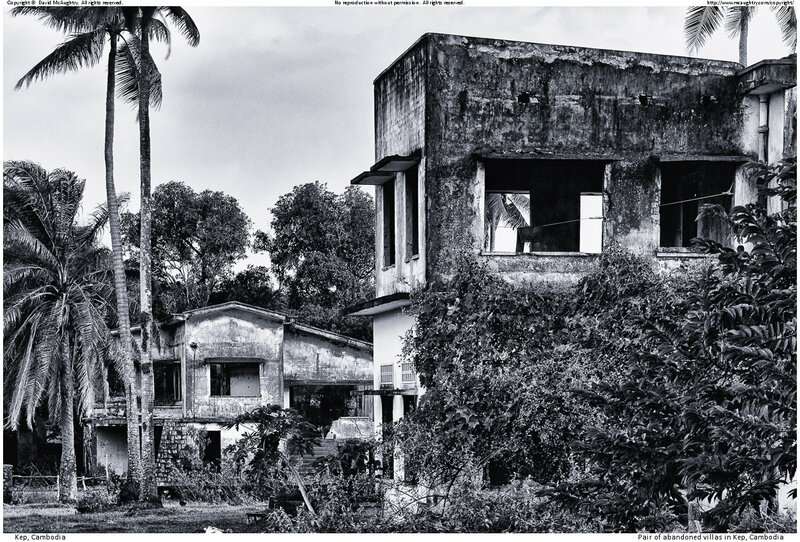 I had in mind a black and white photo-essay charting the destruction of a once elegant colonial era, harking back to my own days as the son of a colonial railway engineer in 50’s Malaya. The driver somewhat understandably wanted to show me all the nice and new parts of the town, and became more and more baffled and eventually resigned as I kept stopping off at the most disheveled and seedy structures to take photos. Kep was known as Kep-sur-Mer in the old days. It was established by the French in 1908, probably because of the riviera-like sweep of beach in the main town. As in Malaya, it was built as a rest area for the colonial rulers to provide a slightly cooler break from their bureaucratic duties up-country. I had expected an architecture therefore that was reminiscent of native French villas of the inter-war years. Actually only a few villas had that appearance – only the first one in the photo stream below. The rest had a more puzzlingly modern appearance – almost le Corbusier-like. 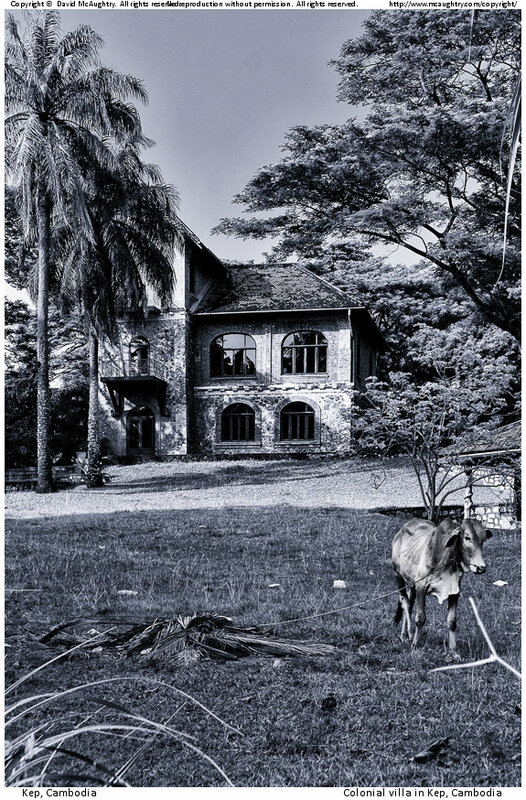 A little research revealed that these were almost certainly built in the first Sihanouk era after independence in ’53. 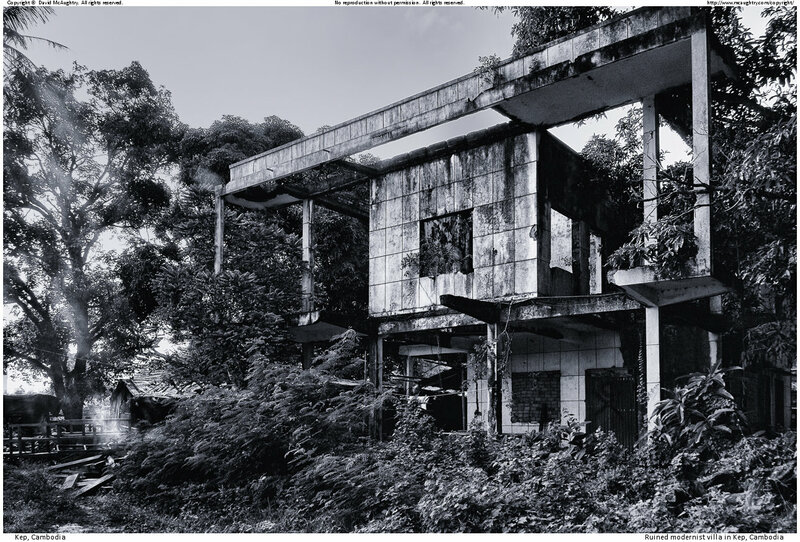 At that time, the French educated and influenced Sihanouk was engaged in a dash to modernize the country, and deployed a cadre of modernist architects known as the New Kymer group to built a series of elegant structures in Phnom Phen and beyond. These were highly admired, and became a centerpiece of the capital in the glory days of the late 60s. All this ended as the USA continued its comprehensive destruction of the region with the CIA-instigated overthrow of Sihanouk in 1970. 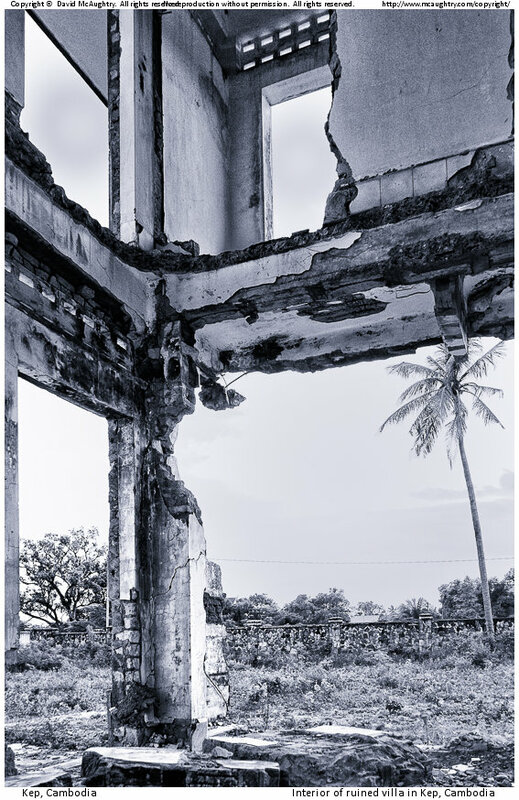 After this time, and particularly during the fearsome regime of Pol Pot and the Khymer Rouge, these seaside villas were looted and then destroyed or rendered uninhabitable, as happened also in Phnom Phen. They remain as skeletal reminders of a distant and more elegant past, each in their own overgrown gardens, looking forever out to sea. 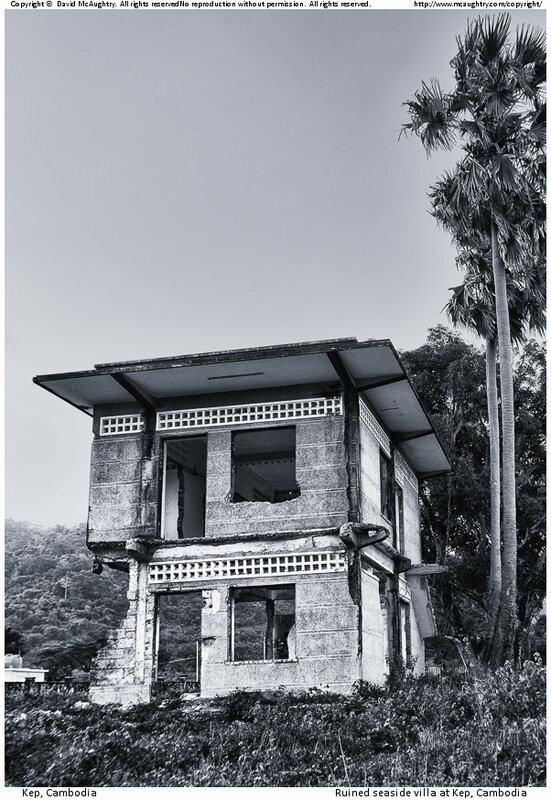 I cannot find any photographs of these structures as they originally looked – so these shots will have to suffice, populated with imagined ghosts of children playing, and their fathers, mothers, sitting in their elegant whites, smoking, and talking politics, little imagining the tsunami to come. 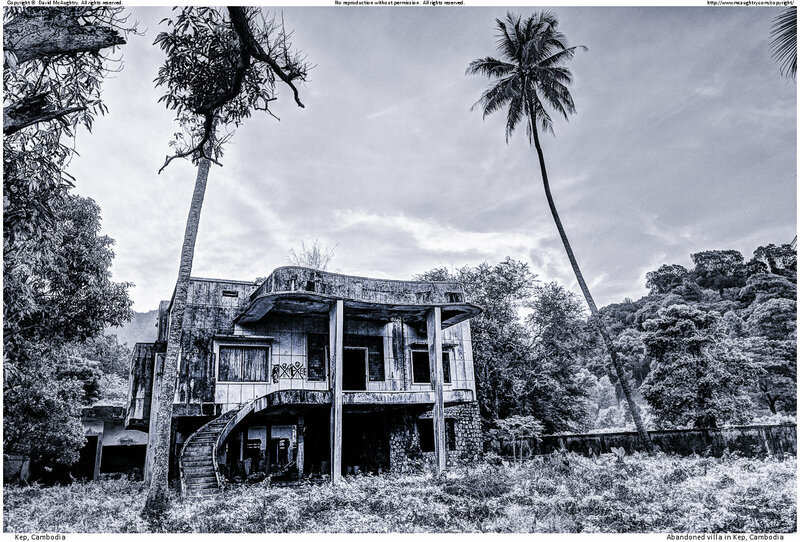 This was one of the few intact colonial villas remaining in the centre of Kep. 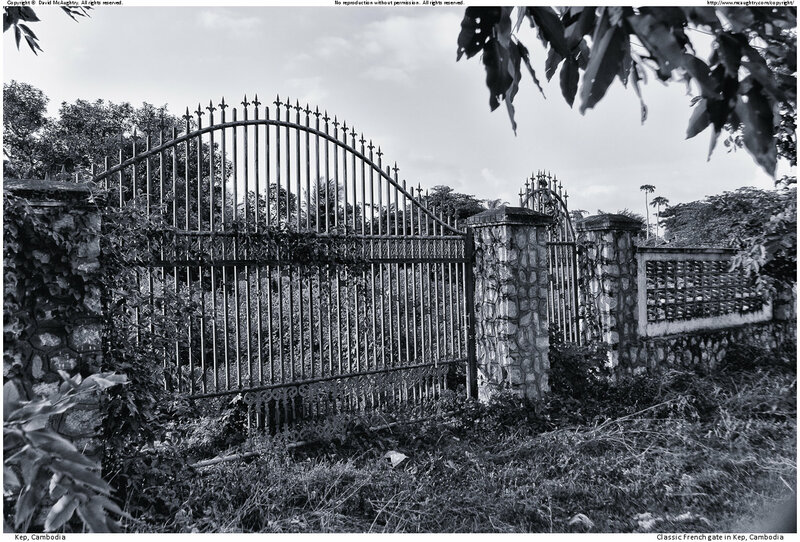 This gate could be seen anywhere in France today at the entrance to a large manoir or chateau. 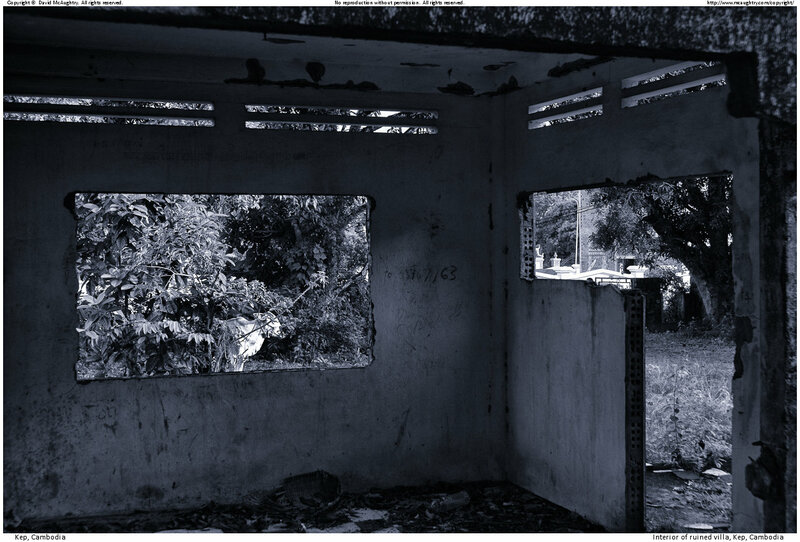 In Kep, they exist alone, the only reminder of the estates that used to lie behind. More modestly sized, and therefore a mystery why it is ruined. It remains in its little plot, uninhabited and unloved. Some of these villas were quite large, and its hard to understand why they are not occupied by multiple families today. This must have been a lovely place with a large garden and perfect sea views from upstairs. Note the air brick ventilation at the top of each wall - they would have been cool and airy also. This place must have been magnificent in its heyday with 180 degree views of the sea. Again it has been rendered completely uninhabitable, with only the skeleton remaining. The only villa I could truly say is French bourgeois in style - this one sits behind the crab market. 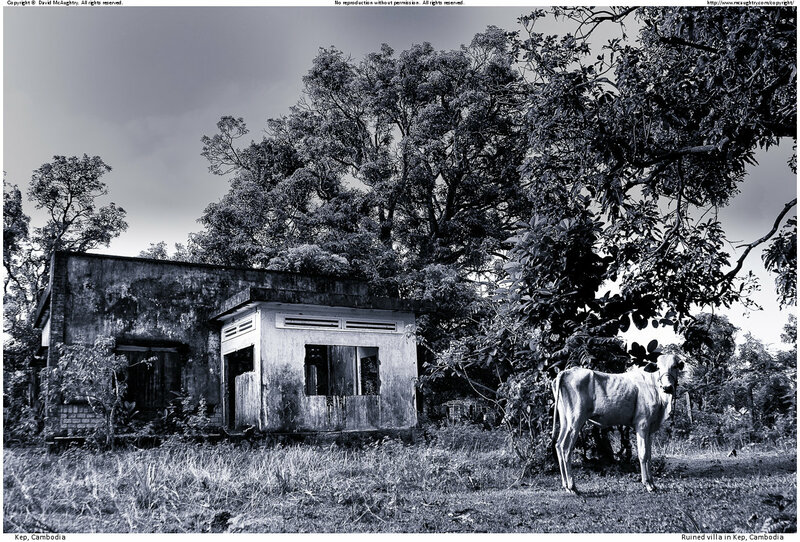 A 3-image HDR shot taken at dawn.